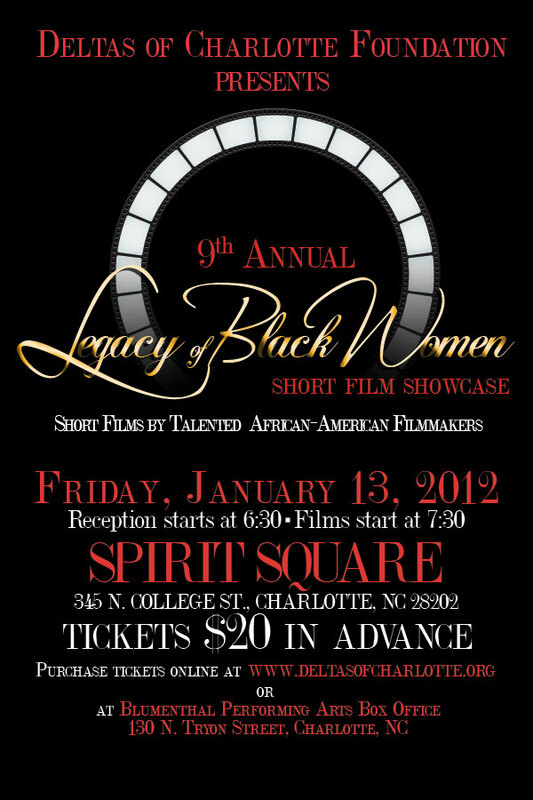 The Ninth Annual Legacy of Black Women Short Film Showcase, featuring award-winning short films by African-American filmmakers, takes place Friday, January 13 at McGlohon Theater at Spirit Square (345 N. College St.). It's a signature event of Deltas of Charlotte Foundation, Inc., the nonprofit fundraising partner of Delta Sigma Theta Sorority, Inc. Charlotte Alumnae Chapter--the beautiful ladies who wear red and throw their hands up to form a triangle (it's like a gang except they're intelligent and do good deeds for the community). Hundreds attend the film showcase each year and, coincidentally, this year's event falls on the anniversary of the sorority's 99th anniversary (they were founded January 13, 1913). The film event opens with a reception at 6:30 p.m. that'll feature food as well as merchandise from local vendors, followed by the films playing at 7:30 p.m. Tickets are $20 in advance and can be purchased at www.carolinatix.org or by calling the box office at 704-372-1000; price is $25 at the door. A portion of the proceeds will benefit the Dorothy Count Scoggins/E.Virginia Shadd Breaking Barriers Scholarship. To nearly be approaching a decade-long run, the success of the Legacy Film Showcase is a testament to the strength of the Deltas, and for several years it benefited from the consultation of Dennis Darrell. Darrell was a longtime promoter of independent film in Charlotte until he passed away in 2010. The Deltas are doing a GREAT thing with their annual film festival!